Back in the day the Doctor Who spin off novels had a real advantage over the TV show as they had no budget. The limit to what could happen in these books was not down to the pen pushers at the BBC or the naivety of special effects. The only limit to the books was the author’s imagination. Go big or go home as no one will tell you no. 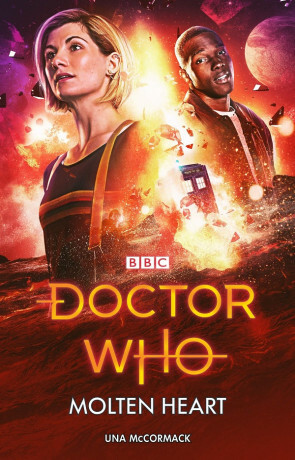 By Doctor Number 13, even the BBC can pretty much do what they want with CGI so the novels have lost one of their unique selling points. Molten Heart by Una McCormack has to be more than just big ideas, it also needs to be a great story. On the surface the planet of Adamantine looks a little dull; pretty, but not much going on. However, deep below the surface live a fascinating species of being that are formed from the very rocks they reside in. They are unaware of anything above the cavern ceilings above their heads, but when cracks begin to appear their habitat is at risk. Enter The Doctor and her companions. Can this strange breed of fleshy aliens save the rock people of Adamantine or should they just be thrown into the brig before they can even try? When hitting the brief to have an imaginative story Molten is a winner. The idea of a race of people fashioned from rock is fascinating. Just the interactions alone between the Doctor and the rock people is interesting. One side appears to be sentient rock, whilst we come across something akin to a walking mushrooms. There is an interesting back and forth in the book as the people of Adamantine cannot decide whether to trust these aliens or not. McCormack does not rest on her laurels by just creating an interesting world, she also develops a political power struggle for the hearts and minds of the Adamantine people. Some are open to the idea that there is a surface above them, whilst others are vehemently opposed to the concept. The battle to see which side succeeds reflects on our own modern politics in interesting ways. The ideas in Molten are a real success and the reader is drawn into a book of strange sights and alien concepts. It is elsewhere that some cracks appear (and not just in the canopy above). Some Doctor Who books can come across as a little naïve and that is the case again here. The scientific concepts are adult, but some of the character back and forth is more juvenile. This may be the audience that the TV show caters for, but I have always found the books that talk to all readers with intelligence are the best. The naivety continues during the action set pieces. It is fun to see our pals fight against lava flows, but a little unrealistic even for the world of The Doctor. I also found the way that the Doctor was able to integrate with the Adamantine rock people so quickly a little too fast. I know that she is an expert in this, but The Doctor and her companions must look so alien to these underground people that they would blow their minds. I really enjoyed the fact that McCormack went big with the ideas and adventure in Molten and there are concepts on offer here that are probably still too big for a TV show to replicate. The book is at its best when discussing intelligently the makeup of the Adamantine people and how their society works. It falls down a little during the action as some juvenile roots sneak through. A younger Doctor Who fan will get a lot from this book; intelligence and adventure. Older fans will still enjoy themselves, they will just notice the naivety a little more clearly. Written on 26th March 2019 by Sam Tyler.